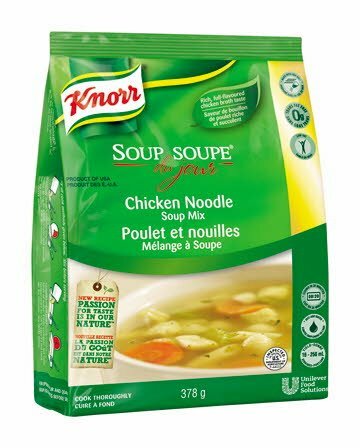 Savour the traditional taste of homestyle chicken noodle soup with flat, wide noodles, and 100% chicken. Comfort food at its best! NOTE: Product MUST reach a minimum of 180°F (82°C) measured with a thermometer for 2 minutes by all cook methods given below. Stir before serving.Canada Stove Top: In a suitable container, gradually whisk contents in 4 litres of water. Bring to a boil. Cover and simmer for 20 minutes. Stir occasionally. See NOTE above.Canada Convection Oven: In a suitable container, gradually whisk contents in 4 litres of water. Cover container. Set oven temperature to 176°C (350°F) and cook for 60 minutes. See NOTE above.Canada Kettle Cooker / Canada Steam Table: Gradually whisk contents of package in 4 litres water. Cover container. Set unit on HIGH and cook for 45 minutes. See NOTE above. Great as a main dish entrée, or try adding tomato sauce, garbanzo beans and chopped, canned tomatoes for a Chicken Tomato soup.